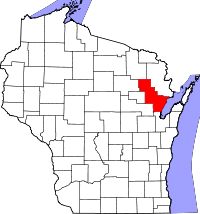 Oconto County, formed in 1851 from unorganized territory, has marriage vital records dating to 1855 but deaths only to 1872 and births to 1876, with registration of early events sketchy until 1907, when statewide registration was mandated. The Wisconsin Historical Society maintains historical records, with a statewide index on microfiche and online. Recent records dating from October 1907 to the present can be ordered locally from the Register of Deeds in Oconto, with divorce records from the Clerk of Court, or from the state Department of Health Vital Records Office in Madison. Uncertified copies are unrestricted and available for $20/order by mail, fax, or in person. Note: One index since 1/1/2000. Federal tax liens may be searched separately.